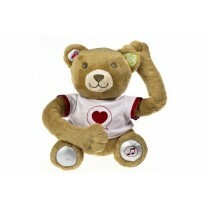 Here comes the sound teddy bear : baby will love to hear mom and dad's voices recorded in his teddy bear. This Teddy will be quickly adopted by all the family, will grow up with baby ; and soon, it's baby himself who will leave you messages ! Convinient :the message can be listened as many time as whished, or new message can be recorded at any time. The bear is delivered ready to go with Alkaline batteries and the batteries compartement is reachable to replace them when needed. 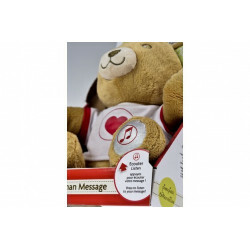 - Mommies' Price - The Mommy message Teddy was elected Mommies' price by a jury of moms and dads who are bloggers, in a current partnership with the magazine Parole de Mamans during the French Childhood fair Babycool. Function enregistre un message ou une chanson pendant 60s.